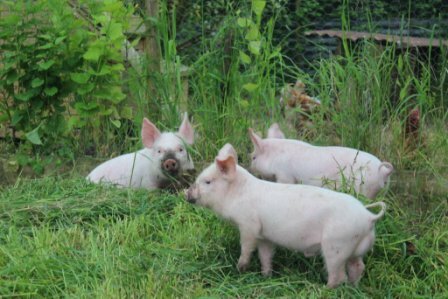 By the end of May we’re usually feeling strong enough to start thinking about getting piglets again, ready for a summer and autumn of fattening. This year we returned to Andrew Tuck, our usual supplier, to find he had only three available, unless we wanted to wait. We didn’t, and these three have moved in next to the hens, on a bit of garden we want levelled. The black nose shows how much they love digging already – their first taste of life off concrete. They are younger than the weaners we usually get – six weeks rather than eight or nine. This means they are verging on being quite cute, but that will soon pass. They are middle white/large white crosses, two girls and a boy. He was a bit runty so we got him cheap. 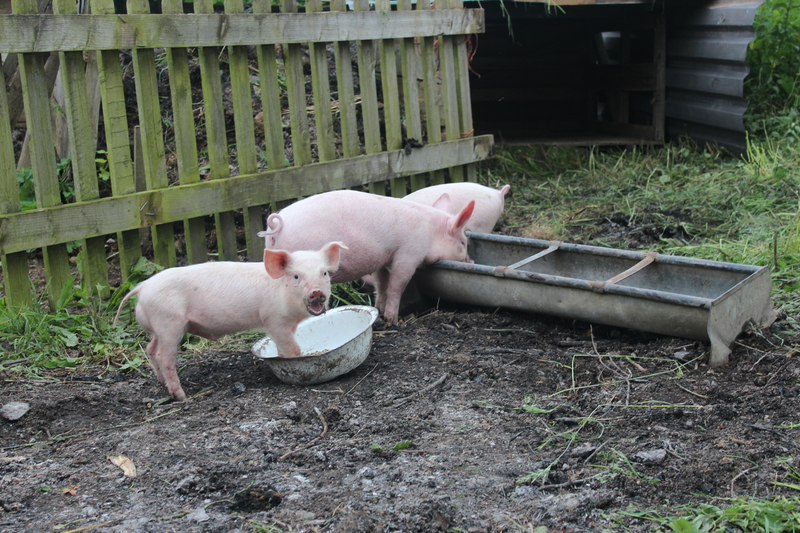 They are the classic ‘pig’ – pink, sticky up ears, curly tails and busy little snouts. This time we’re going to keep closer track of how much feed they should be getting, so they don’t grow too slowly, but there’s already talk of keeping one of the girls to breed from next year. I think we need an update on pig growth here now please. I think you’re on to a good thing though given how much I spend on sausages these days. How’s the garden coming along too? We’ve just had a bumper crop of plums and the apples are ripe and ready too. Makes it feel like Autumn could be early this year since it’s not even September yet ooo-arrr.